The ancient world believed that the universe was made up of elements both material and spiritual. These elemental forces affected human life positively or negatively and any human being who could share their energy was a person of great significance - a human agent of cosmic power. This is a significant part of the background of the life and career of Jesus of Nazareth. The present work is a reappraisal of Synoptic accounts of Jesus and his followers in the light of recent developments in the study of ancient magic. 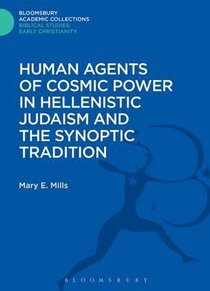 About "Human Agents of Cosmic Power in Hellenistic Judaism and the Synoptic Tradition (Bloomsbury Academic Collections: Biblical Studies Series)"
Mary E. Mills is currently engaged in research and teaching in religious studies at Liverpool Hope University, UK.